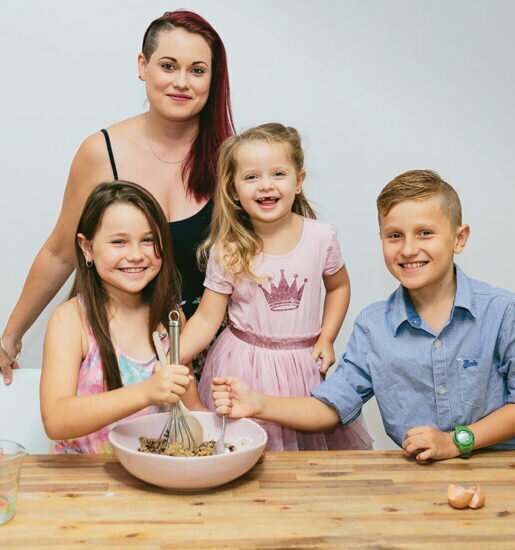 LEARN HOW OTHERS REDUCED THEIR HOME LOANS BY 30-90K IN ONE YEAR! The more organised you are with your money the more you will have. 2018 sees the launch of My Big Money Goal and the Think Money Budget App this could be the answer! Come and see us. Chris was a financial planner for 10 years prior to becoming a mortgage broker specialising in debt reduction. 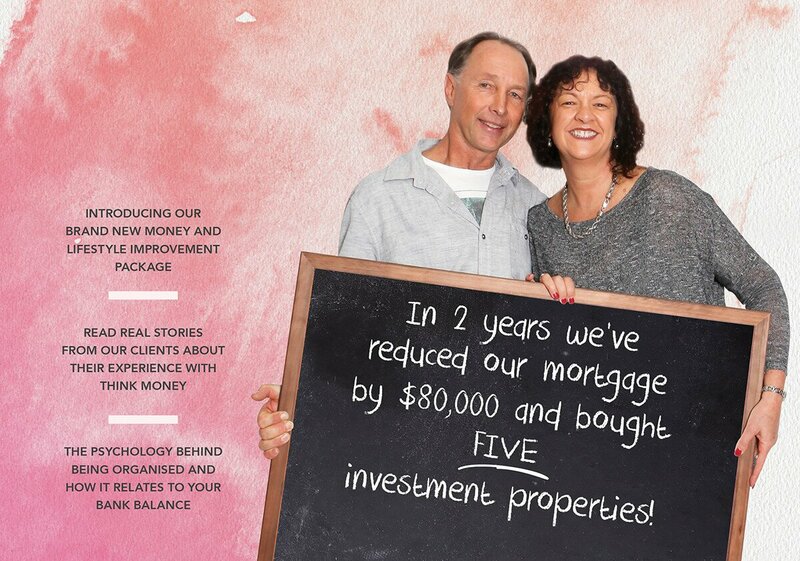 Jack and Chris began to plan their retirement and built their own property portfolio. 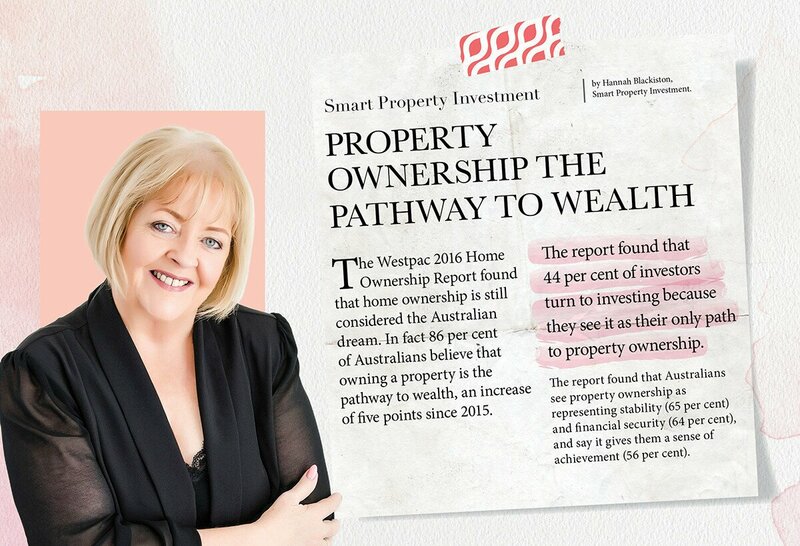 Chris’s clients wanted to follow her lead and learn how they too could build a property portfolio, thus Think Money Wealth Through Property was born. Chris says “The look of amazement when people realise what they can actually achieve is priceless”. Budgets usually don’t work, because just like dieting, any restriction, hardship or “lack-of” isn’t sustainable. Most people find using a budget to be a painful experience. Budgeting is not just about writing a list of expenses and making sure the cash coming in is more than the cash going out. What you really need is a Cash Management System that works together with your goals so you have a reason to make it all worth while. By setting your goals and getting them in writing, you can create the perfect combination of organisation and rewards to ensure you get a sense of achievement. Then we work out where you can save even more by getting rid of the leakage and wastage. By focusing on minimising the money wastage and not on decreasing your lifestyle, our program is sustainable, achievable and fun. And to make it even more fun, this is packed in to a 12 week challenge, which not only accelerates your results but ensures a constant sense of achievement. Just like our health and fitness, making lifestyle changes, goal setting and benchmarks for tracking our success makes our money workout work. Let’s get our money fit and healthy for 2018! It is amazing once we stop and set goals just how quickly they come. We hear about this all the time, and often we are just busy busy busy and put it off. Writing down your goals will make a difference to your bank account – a DRASTIC difference! The more organised you are with your money the more there is. The more organised you get with your life the more time you have. And finally, by making the time to get organised with your work and your life in general the happier and healthier you are! And that’s a FACT! When budgeting, most people try to reduce debt by tightening their belt on their fun spending. This fails because we can’t sustain working hard when there is no fun or rewards. We then blow the budget with break outs. 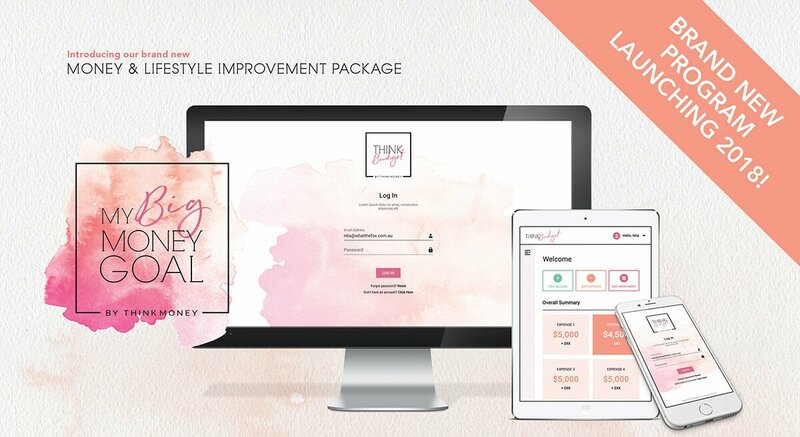 Our program is designed to find the leakage and wastage of where your money is going that is giving you no pleasure such as fees and charges, unused subscriptions, excessive wastage of food, money spent because of disorganisation and lack of time. It is like finding magic money! 4. Make it a habit, review & repeat! Once you get started the system just gets better and better. Goals are reached and new ones need to be set. We review the money and make any adjustments and repeat. The money goals like paying out credit card debt, reducing your mortgage, having money saved for holidays and Christmas come thick and fast. My BIG Money Goal can make this year your best year ever. 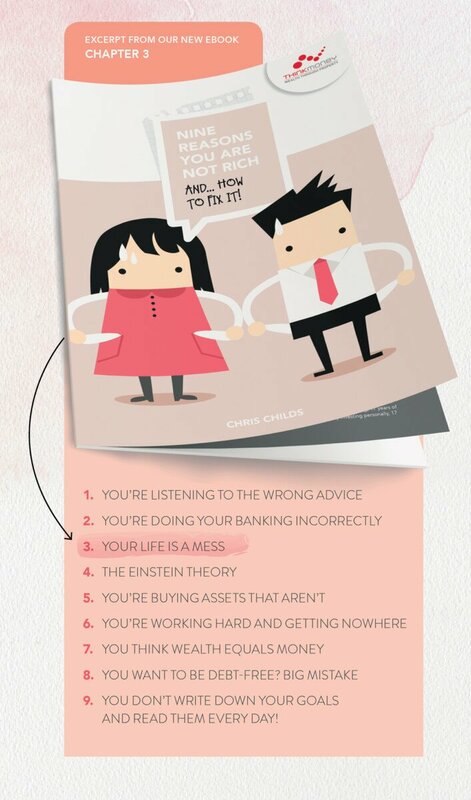 Download your own copy of the full ebook ‘Nine Reasons you are not Rich, and how to fix it!’ from the ‘Free Resources’ page at thinkmoney.com.au. The one thing that holds most people back today more than any other thing is lack of time, or at least the perceived lack of time. It is amazing when you consider we all have exactly the same number of minutes, hours and days each week – yet some people seem to achieve so much more. One of the biggest changes you can make in your life is to ‘declutter’. I don’t just mean declutter the house, however, that is a superb place to start! I mean declutter everything. Declutter your mind, declutter your money, declutter your day/ week/ month, declutter your job. If you want something done, ask a busy person. They seem to have a knack for being able to get more done than most of us. These supermen and women just seem to have a laser focus and burn through their tasks. They usually manage to run a household of kids, spouses, a job and still have time to be the superhero for a charity or school event. If you aren’t one of these super humans – and want to strangle the one or two you know – let me tell you one of their super success secrets. They declutter – everything. I am going to talk superwoman, however, there are often great supermen out there too – so take no offence at the gender selection in this case. Very few busy successful superwomen live in a mess. Let’s face it – they are just too busy to accumulate junk. They don’t swan around the $2 shops buying endless cute but useless objects, and they are often a little heartless if they are gifted such items. They usually don’t last a week. So, if you want to become a superwoman – start by having a long hard look at your house. Walk in the front door like a visitor coming in for the first time. Gives you a bit of a different view point doesn’t it. Superwomen start each day with a task list (usually created long before they arrive at work). It includes work kids, social and personal tasks, and is prioritised. Managing their time is paramount – they handle a file once, they finish their jobs off and they take those few extra minutes to finalise and file. Try it, start a morning ritual of getting your list done, you can start each morning by transferring anything from the previous day’s list forward. Most superwomen find at least 10 minutes every day for meditation or focused relaxation. It might be sitting quietly, it could be yoga, or being able to get the headphones on and go for a walk, jog or run. They visualise their day, their week, month, year. They set themselves clear goals and reward themselves when they achieve them. They treat themselves nicely. They don’t berate themselves. They are their own best friend and cheer squad. They know they are a superwoman and they are proud of it. It is so easy to beat yourself up and relive your failures over and over like a broken video clip instead of moving on and celebrating the wins. Be your own cheer squad, if you feel good about yourself, everyone else will notice, they will think you’re a superwoman too, even when you still have your L-plates on. So, what has all this got to do with getting rich? EVERYTHING!! Getting organised with your money is the easiest way to reduce debt and creating wealth over time. The rich know what their money is doing. They pay their bills on time and eliminate waste and leakage (spending money on stuff that gives you no pleasure or benefit such as bank fees). They have a great lifestyle and a plan for their financial future both short and long term and they stay focused on it. Now we have an OMG moment! Learn the secrets of these two superwomen in a workshop designed to help you soar into the new year! Chris Childs is renowned for helping people achieve their personal and financial goals. Hear Chris’s personal story of how goal setting and The Passion Test changed her life. Charmaine’s Strong Lady Show has been touring the world since 2003 performing in 22 countries. Sculpting your beliefs for a new ‘you’. Lifting the weight of worry. Building gym sessions of the mind. Developing mental strength & resilience. We had one investment property but knew that was not enough to secure our future. I knew property was the way to go but we were stuck on how to take the next step. While reading about Think Money in the Profile magazine over coffee, I knew we had to see what this was about. 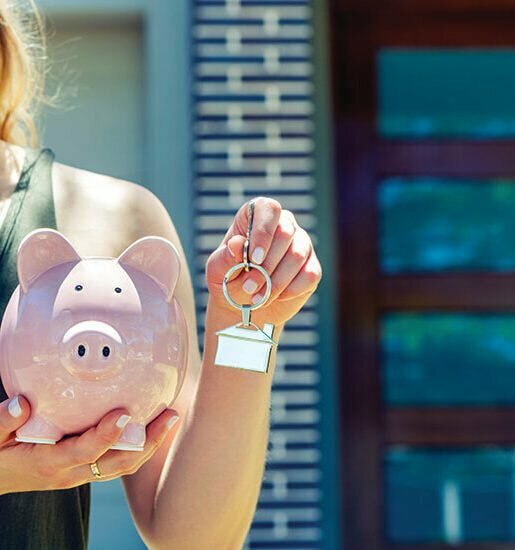 We had the means to purchase an investment property but the way our finances were structured, we couldn’t see how we could purchase another property. Then we had a meeting with Chris, who explained how to restructure our finances and increase our wealth through property. Since September 2015 we have paid off $35,000 on our home loan, purchased one investment property and are looking at purchasing our second. 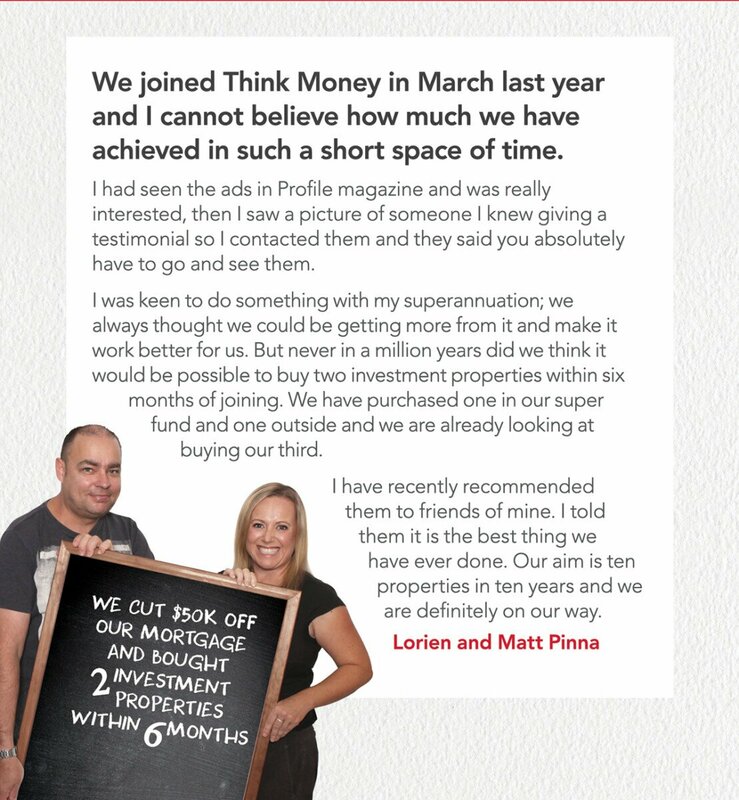 We are very happy we joined Think Money and thank Chris and her team for all their help and advice.